7man on Sun, 05/17/2015 - 12:47pm. I was saddened by the vote at the AIA convention. If we do not hold accountable the perpetrators of this attack on The WTC, then, no building in the World is safe. The Architects that voted against this resolution should not be designing buildings especially large steel framed buildings as this vote does not question the NIST report and in so doing accepts the conclusion that fire brought these buildings down, not once but three times on 911...As We know, never before had a steel framed building collapsed due to fire. The AIA vote defies the basic laws of Physics and the research by reputable engineers, architects and scientists whom have jeopardized their careers and lives by questioning the NIST report. I sincerely appreciate the effort by Architects and Engineers for 911 Truth who put this resolution to the AIA and in so doing brought an important issue back into the limelight. I also am thankful that 4% of the AIA members in attendance voted for the Resolution. 250 members of the AIA also signed the petition for a new investigation. Murder has no statute of limitations and because of the many 911 researchers and journalists, We have a good idea who was involved in the planning, implementation and coverup of this complex false flag attack. They will be held accountable and must live every day knowing that the plot they were involved in.. caused and continues to cause so much misery to others. they cannot escape and must live with this 'faustian bargain' as long as they live. SunDog on Mon, 05/18/2015 - 6:59pm. That's right. 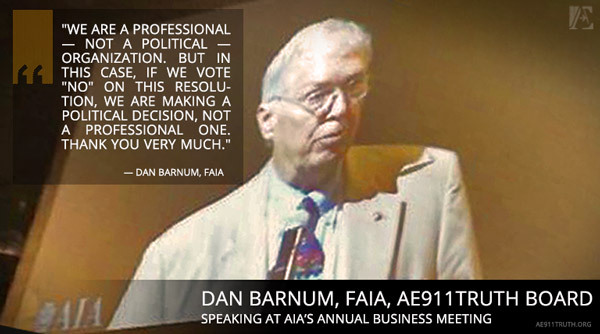 96% of voting AIA delegates voted with intentions and goals outside the realm of science and reason. Could it be that to 96% of AIA delegates two planes CAN symmetrically destroy three massive towers at freefall speed through the path of most resistance? Can it be that to 96% of AIA voting delegates a 47-story state-of-the-art tower CAN disintegrate at freefall speed due to ordinary office fires? If this was really the case, would you trust these people to build the apartment building you live in or office building you work at? Joe on Mon, 05/18/2015 - 7:24pm. Joe on Fri, 05/29/2015 - 9:43pm. Glad you placed this video here. This helps in coordinating the historical record. TomT on Sat, 05/30/2015 - 10:32am.